Medium bodied and stylish, the palate ends with a long and dry, discreetly fruity finish. 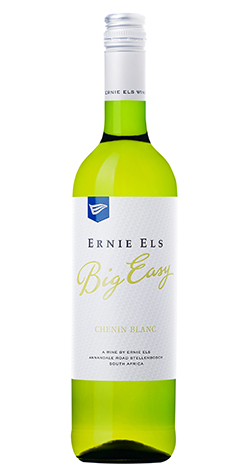 The 2016 Big Easy Chenin Blanc is loaded with ripe mandarin and lime on the nose, leading to notes of early spring jasmine and cling peaches. The tropical palate is richly textured with hints of wild herbs and Indian spice, adding complexity and good depth. It is medium-bodied and unhindered by oak giving a lively fruit structure and soft and easy finish. Drink and enjoy now. Early cultivars ripened later but an extremely dry and warm December resulted in the late cultivars being ripened as normal. Ideal weather conditions during the harvest season prevailed with moderate day-time temperatures, cool evenings and no prolonged spells of rain or heat waves; this all impacted positively on grape quality and establishing good colour and flavour. It was also a particularly healthy year and diseases, pests and rot only occurred later in the season, while the warm and dry weather conditions together with effective disease and pest control resulted in minimal losses. Grape bunches were gently de-stemming with a Bucher de-stalker and lightly crushed. The wine was settled overnight and the sediment racked-off the following day. Fermentation took place at low temperatures (12-14°C) in stainless steel tanks with a combination of yeasts, over a two week period. Working very reductively in the cellar after both crushing and de-stemming, post fermentation lees contact was maintained for 4 months with weekly stirring of the lees before racking and stabilization prior to bottling. This wine is made in a fresh and fruity style without any wood component. As one of South Africa's leading ambassadors and one of the most recognizable faces in the world of sport, it is befitting that Ernie chose Stellenbosch to produce his wines. In 1999 the concept of Ernie Els Wines was born and with the help of award-winning winemaker Louis Strydom, they produced the maiden, 2000 vintage of Ernie Els - a 'classic' Bordeaux blend. The marketing synergy between the wine and Ernie's 'classic' golf swing were apparent. The intention from the outset was to focus on delivering a quality product that could hold its own in the company of the world's finest wines. Naturally the plan was to start on a small scale, ensuring the packaging and presentation, marketing and distribution, were of a standard that was in-line with their vision for a premium product. While men may dream different dreams, they are driven by the same quest: to reach for, and to accomplish perfection. No two pursuits bare the truth of this more than the perfect round of golf and the perfect bottle of wine. Ernie Els' life has mirrored a passion for excellence, which has been clearly reflected in his exceptional sporting achievements. His focus, discipline and commitment have been the foundation of his success, and these factors are evident in his quest to produce premium wine.